Looking for a fun tabletop game to play with the family? Download The Just Us League! The world needs saving, but the worst superheroes are the only ones left! Can you convince the President that you’re the best hero for the job? The Just Us League is a card game for 3 or more players. The players assume the roles of underwhelming superheroes with less-than-useful weapons, each vying for the President’s permission to save the world from the current catastrophe. Download the cards here! Includes four decks: Hero, Weapon of Choice, Culprits, Catastrophes; and one ‘President’ card. Set the Dynamic Duos deck aside, it’s for a variant ruleset detailed at the end of this page. The other players draw one card from the Hero deck and the Weapon of Choice deck. This is their persona for the round, and each player is hoping to be the superhero that the President selects to save the day during this catastrophe. The President now calls on a player of their choice. That player reads both of their cards to the group. For example: “My name is Catfoot Nelson, and I can climb walls and fall any distance without being hurt. My weapon of choice is the Viper Rifle, a gun that shoots venomous snakes.” Now that player gets to pitch to the President why they should be selected to be sent on this mission. The President can ask any questions they want during the pitch, and can choose if other players are allowed to interject when it’s not their turn. 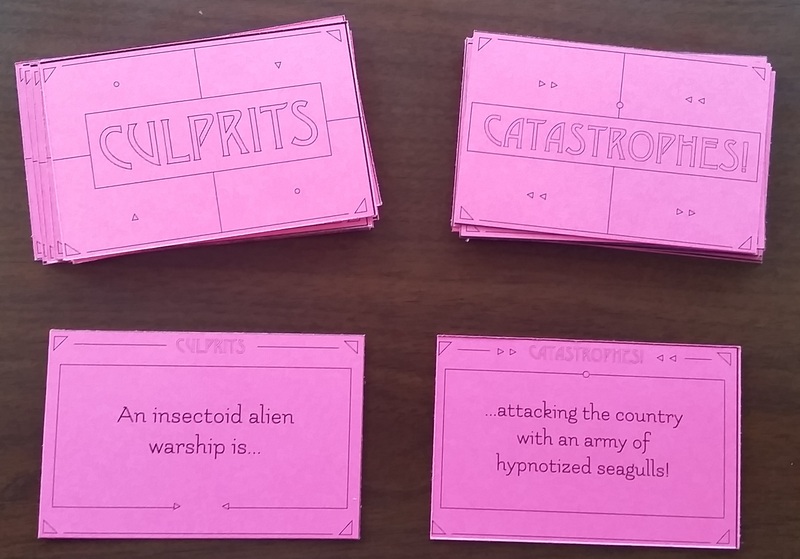 After calling on every player and hearing everyone’s pitches, The President chooses which hero to send on the mission and gives that player the Culprit and Catastrophe cards, where they now serve as Victory Points. The next round now starts: the President passes the ‘President’ card to the player on their left, and that player is the President for this new round. Resolving disputes: If there are disagreements or confusion on how to interpret a card, or on whether a player can realistically do what they are suggesting their powers or weapons allow, the President gets the final say. Winning: Play continues for the decided-upon number of rounds. When those rounds are over, each player counts their Victory Points as represented by the Culprits and Catastrophes cards they won, and the player with the most is the winner. 2-player game: If playing with only two people, there is no President. Each round one Culprit and one Catastrophe is still drawn, and the players each draw a Hero and a Weapon of Choice. The players then debate between each other who has the better chance at solving this catastrophe. Once both players agree, the winning player gets the Victory cards and play continues to the next round. Dynamic Duos: This variant uses the ‘Dynamic Duos’ deck and requires an odd number of five or more players. Not counting the President, the players will be teaming up into pairs for their pitches. Before the game begins, prune the Dynamic Duos deck so it only has one pair of cards for every 2 players. Every round, shuffle the ‘Dynamic Duos’ deck and have the non-President players draw one Dynamic Duo card in addition to their Hero card and Weapon of Choice card. Each pair pitches as a team, and when the President chooses the winning pair, the two Victory cards are split with one going to each winner. Credits: Card artwork drawn by Kristen M Thompson. Cards designed by Melvin Alvarez. Game was devised and written by aabicus. Cards and instructions edited by Sydney Meeker. Title font is ‘Ruoste’ by Junko Hanhero. Special thanks to my playtesters and the students and faculty in the UCSC Game Design Master’s program! All product names, logos, and brands are property of their respective owners. All company, product and service names used in this card game are for parody purposes only. Use of these names, logos, and brands does not imply endorsement.